The past week has been pretty hard going, as we’re all still getting our head around losing my Gran. The house feels very quiet without her. We used to have carers coming in four times a day, along with various nurses and the GP, so it feels very strange to suddenly have none of that. We’ve been trying to focus on arranging her funeral, which is now booked for the 7th December. It would have been her 92nd birthday on the 5th, and with Christmas coming up as well it’s just hard to feel motivated to do happy things. But I’m just trying to get through one day at a time and making sure we all spend family time together. Last Sunday a friend I met on the pain management course offered to take me out for lunch. If I’m totally honest I was really tempted to cancel, as I’m finding just getting out of the house quite a challenge at the moment. But I pushed myself to do it and it turned out to be a good distraction. We had a good chat and enjoyed a Costa (I had their mulled hot fruit drink and a blueberry muffin if you’re wondering) and then had a little look round a great shop called Outfit, while we waited for our lift. I found this gorgeous coat in Miss Selfridge, which was an amazing half price, but sadly they didn’t have my size. On Monday I somehow managed to drag myself into Uni, as I knew we were having a preparation lesson for when we go to the Crown Court next week. It was hard work trying to carry on as normal and be sociable, but I know I need to keep pushing myself to do it. My Dad met me at lunchtime and offered to take me out to try and take my mind off things. We found a lovely little café in the Lion and Lamb yard, Farnham, called Candy Twist. 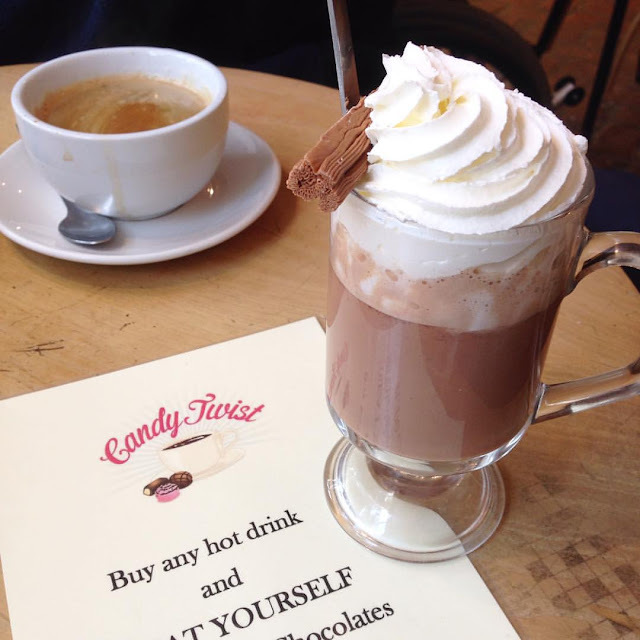 I had the most amazing soya hot chocolate (with cream, marshmallows and a flake – oops!) 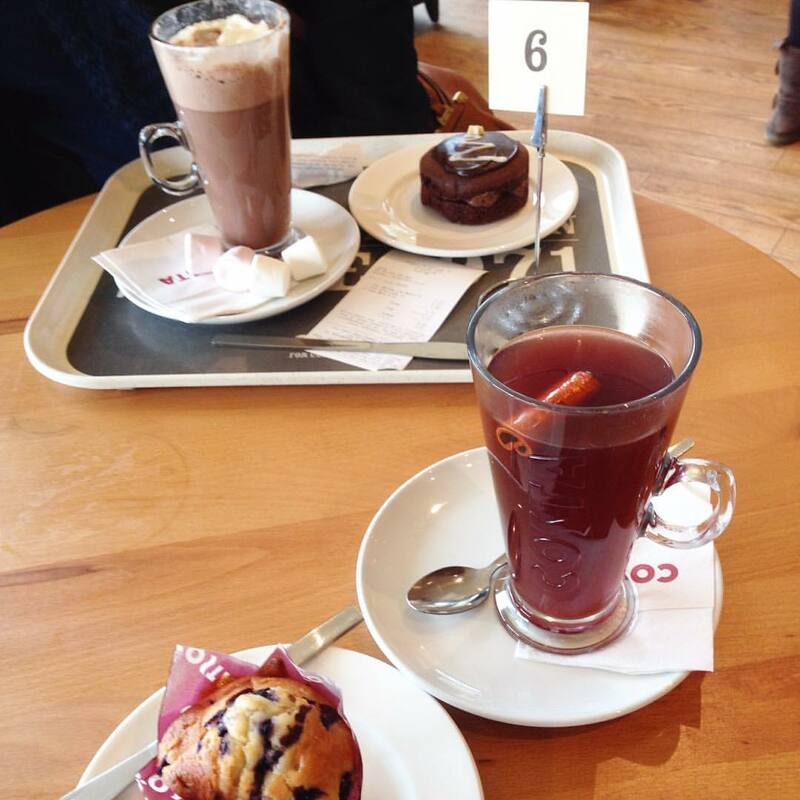 and a croissant with Brie and cranberry – very Christmassy. There are so many cute little places to eat in Farnham – I’m looking forward to trying out more of them over the next few years. Tuesday was relatively quiet, although I had an appointment with my Urology nurse to have my catheter changed, and had an ECG at the doctor’s surgery in the afternoon. But these beautiful flowers arriving in the post, sent by my lovely friend Leanne, brightened my day up. Our house really looks like a florist at the moment, which is nice because my Gran loved flowers. My Wednesday was fairly busy – a lady came to see me in the morning to do some training with me for the computer equipment I was given through my DSA. I was pretty shattered after doing that all morning, so was pleased to then go and see my friend, Katy, for a relaxing massage. My Mum and I popped into Waitrose on the way home, and she treated me to these adorable Christmas cupcakes (I didn’t eat them both at the same time!) The snowman is a vanilla sponge with coconut icing and the reindeer is a chocolate sponge with salted caramel icing – yummy! They also do a Christmas tree, which is a red velvet sponge, and a Christmas pudding, which I think is a chocolate sponge. On Thursday I decided to go into Uni for a bit in the morning, but I felt so exhausted that I couldn’t really concentrate. I had to leave mid-morning, as I had an emergency appointment with my mental health care co-ordinator. My mental health has really deteriorated recently, so I’m working with them to try and keep me out of hospital. We had a good chat, and are going to see each other weekly to try and keep me as stable as possible. I was pretty drained after our meeting, so it was nice to come home to find my membership for EDS UK has been renewed. I snuggled on the sofa with a fruity tea and some Percy Pigs. Friday morning my Dad took me over to the hospital for another session of my pain management course. Unfortunately, there had been a bit of a mix up and neither of the facilitators were there, so myself and the other group members sat and chatted for quite a while until the psychologist arrived. I had decided not to go into university in the afternoon, so my Dad just brought me home after the pain course. I spent the afternoon writing a feature article for a Uni assessment, so I think I made good use of my time. I then chilled out a bit and flicked through some of these Christmas catalogues to try and get myself feeling a little bit Christmassy. Yesterday I ended up sleeping in until quite late, which definitely wasn’t planned but I obviously needed it. I had a quiet morning; then in the afternoon my Mum took me to the Christmas Market in our town. The weather forecast was meant to be terrible – torrential rain and strong winds, but luckily the rain held off and although it was pretty windy, it didn’t ruin the event. I wrapped myself up in a warm coat, mittens, scarf and gloves and listened to my Mum sing some carols in the choir. The Christmas lights were switched on, and Mum pushed me round some of the stalls to see what was on offer. It’s always such a nice community atmosphere there, and although I still feel very sad, it was nice to see people getting excited about Christmas.